Dental crowns can be an excellent solution for a variety of dental conditions. Dental crowns are made from a variety of materials such as metal, porcelain fused to metal, all-porcelain and all-ceramic. Depending on the reason for the crown and where the crown will be placed, we may recommend one type or the other. Dr. Jorgenson prefers to use all-ceramic crowns based on their strength, resilience, and natural aesthetic look. Dr. Jorgenson typically uses Glidewell’s All-Ceramic Lava Zirconia crown. You can read more about Glidewell’s product here. 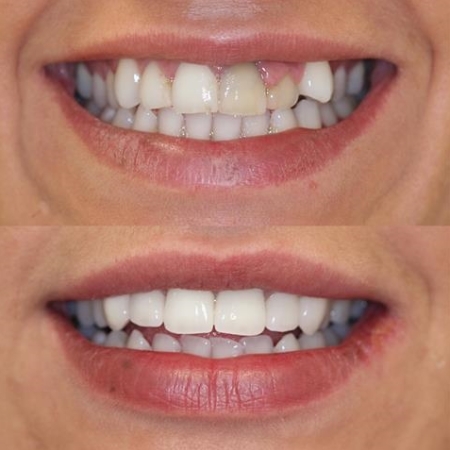 Dental crown used to replace discolored and decayed tooth. Once we have determined that a dental crown is necessary for treatment, we will discuss the different types of crown material and select the best one for your treatment and budget needs. Ceramic Lava Zirconia crowns provide clinically proven durability and resemble your natural tooth shape, shade, and size. 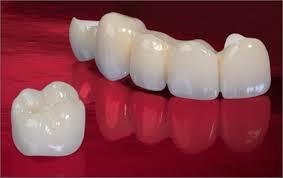 We also offer Porcelain Fused to Metal or PFM crowns. PFM crowns resemble your natural tooth on the outside, but are metal inside and at the base of the crown. These crowns are not as strong as Ceramic Lava Zirconia, but are a suitable option for back teeth and smaller budgets. All metal crowns consist of a piece of gold or silver alloy to cover the existing tooth structure. Metal crowns generally last the longest, but are not aesthetically pleasing and can even cost more money than an all-ceramic crown. The crown procedure is completed in just two appointments. At Advanced Dental Care, we can get started on your crown the same day the treatment is determined to be necessary. First, we will remove any decay from the existing tooth and remove a small portion of the outer area to make room for your new crown. If a large amount of tooth needs to be removed, we will use filling material to “build-up” the area which will help support your crown. Then, one of our lovely assistants will take an impression of the tooth so our laboratory can create a custom tooth that matches the rest of your natural teeth. We will place a temporary crown on the tooth to protect and cover the nerve and remaining tooth structure. The temporary crown is put on with temporary cement that will be removed at the second appointment. Temporary crowns are not meant to be on for a long time or to be as strong as your permanent crown. Scheduling your second appointment within two weeks is essential to preserve the safety and comfort of your tooth. On your second appointment, we will deliver your crown. Dr. Jorgenson will ensure that your fit, bite, and margins are satisfactory and mimic your natural tooth. The permanent crown is cemented into place and your crown treatment is now complete. You will be able to eat, drink, and smile just like you always did or even better!